(Riyadh, Saudi Arabia) History is a witness to the close relationship between Muslims and Jews. That was the message Profesor Mark R. Cohen delivered in two lectures at King Saud University in Riyadh, Saudi Arabia last month on the Cairo Geniza and its importance for Islamic and Jewish history. The Geniza is a treasure trove of medieval Jewish documents housed in the Ben Ezra Synagogue in Old Cairo, Egypt. Cohen is Emeritus Professor of Near Eastern Studies and Khedouri A. Zilkha Professor of Jewish Civilization in the Near East, Emeritus at Princeton University. He was a visiting professor at New York University’s Abu Dhabi campus during the Fall 2014 semester. A professor at Princeton University from 1973-2013, Cohen is the author of Poverty and Charity in the Jewish Community of Medieval Egypt (Princeton University Press, 2005), The Voice of the Poor in the Middle Ages: An Anthology of Documents from the Cairo Geniza (Princeton University Press, 2005), and Under Crescent and Cross: The Jews in the Middle Ages (Princeton University Press, 1994; revised edition, 2008). He was awarded the first Goldziher Prize in 2010 for his scholarship promoting a better understanding between Muslims and Jews. In this exclusive interview conducted in Riyadh, Saudi Arabia, Mark R. Cohen discusses his visit to Saudi Arabia, his career at Princeton, and his views on Muslim-Jewish coexistence. While the interview was conducted in December, its publication closely following the attacks in Paris is particularly timely. Welcome to Riyadh. You’ve been writing about Islam and in particular the Jews of the Islamic world for many decades. What is it like to come to Saudi Arabia for the first time? Here and also in Abu Dhabi, where I’ve been a visiting professor at New York University’s Abu Dhabi campus this past semester, it’s been an eye-opening experience. It’s one thing to study Islam and the Arab world from far away, and, while I’ve visited Egypt and Jordan, I’ve never lived in an Arab country before. Here in Riyadh I’m the guest of King Saud University, particularly the Department of History. I was invited by the wing of the department that teaches Islamic history. They’ve welcomed me with open arms. They know my work. My host is Dr. Torki Fahad Abdullah Al Saud. He finished his Ph.D. in Jewish Studies at Boston University in 2008 and wrote his dissertation on Maimonides and one other Jewish thinker from that time peiod. We’ve been in correspondence over the years, and he sends me his publications in Arabic. He’s an excellent scholar and one of the very few historians in the Arab world writing about the Jews under Islam. I have been discussing the Cairo Geniza, explaining what the Geniza is and its importance for Islamic as well as Jewish history and for the history of the Arabic language. The Cairo Geniza, the most famous geniza of all, is a vast treasure trove of over 300,000 manuscript fragments that were found in a medieval synagogue—today known as the Ben Ezra Synagogue—in Old Cairo, or Fustat. The dated or dateable manuscripts come mainly from the 11th to 13th centuries, but there are papers from the later period; in fact down to the end of the 19th century. It has long been my view that the Geniza phenomenon in Judaism and a similar custom in Islam, and the historical documents of the Geniza, in particular, offer fertile ground for collaboration between Arab and Jewish scholars — so-to-speak on neutral soil, free from the contentiousness that often drives a wedge between the two peoples. Hopefully, Geniza research may someday contribute to improved relations between Jews and Muslims and foster memories of Jewish-Arab coexistence in past times, a distant mirror of what might yet be. Do you think Muslims and Jews need to be reminded of their strong historical relationship? It is clear from the Geniza documents that Jews and Muslims coexisted with a much greater degree of harmony than in some other periods of Islamic history and certainly to a much greater extent in Muslim lands than in Christian lands. The situation today has deteriorated so much that people no longer remember those periods of history in which Jews and Muslims lived together relatively peacefully. Jews were always second-class subjects in Muslim lands, as were Christian and Zoroastrians. They paid a special tax; they were dhimmis, which means basically that were protected as long as they paid an annual poll-tax to the government and observed certain rules to symbolize their inferiority and acknowledge the superiority of Islam. The Geniza reveals Jews integrated into a single world, living and working side-by-side with Muslims. This appears particularly, but not only, in the economic sphere. In the marketplace, Jews had complete freedom of commerce. There was no restriction on their economic activity. This contrasts sharply with the situation of Jews living in northern Europe at the same time, who experienced serious restictions on their economic activity. Does research like yours help to improve the overall atmosphere between Muslims and Jews in the world today? The political situation today is so dismal that historical periods when Jews and Muslims got along much better than they do today seem irrelevant. Conflicting nationalisms, the rise of Islamic extremism, the rise of Jewish extremism, have basically negated the significance of this history for most people. I don’t agree with that at all. I believe that history can teach us something about the potentialities of Jewish-Muslim coexistence. You’ve had a long and distinguished career at Princeton University. Why did you choose to specialize in the history of Jews in Muslim societies? People have asked me why I chose this subject rather than the history of Jews in Europe. After all I am an Ashkenazi Jew; I am not a Jew from Baghdad or Egypt. I have no roots in the Arab and Islamic world. Back in the 1960s when I chose this subject, it was viewed as a much happier period of history than the history of Jews in the Christian world. I was drawn to it in part for that reason. Secondly, it was a quiet little corner of Jewish history, free of contentious post-Holocaust debates about the role of anti-Semitism in the Jewish past. The subject of the Jews of Islam only began to become controversial after the Six-Day War of 1967, when we saw the emergence of a polarization of views about how Jews were treated in Muslim lands in past times. One “camp” claimed they were treated with great tolerance. This was the traditional Jewish view of the “Golden Age” and it was picked up by Arab and Arabist writers, who claimed that Zionism had disrupted centuries of peaceful coexistence. The opposite “camp” argued that the Jews were treated with utter hatred, that they were persecuted from the very rise of Islam, and that Islam is inherently an anti-Semitic religion. These two approaches – the harmony school and the conflict school – stood in polar opposition. I found myself right in the middle as someone who tries to take a middle ground in understanding the nuances of this history. A few of your Princeton students have published a recent book entitled, Jews, Christians and Muslims in Medieval and Early Modern Times: A Festschrift in Honor of Mark R. Cohen (Brill, 2014). How are your students a part of your legacy at Princeton? I participated in approximately 10 dissertations over my career at Princeton. I am very proud of my students. They are all now teaching at universities in the United States or in Israel. When I retired a year and half ago from Princeton, I felt very satisfied that I was leaving behind a legacy of scholarship. I taught at Princeton for 40 years. It was a great career, and I accomplished much. Among other things, I developed the Princeton Geniza Project, an on-line searchable database of historical documents from the Geniza. One of the things I am talking about in Riyadh is how scholars in the Arab world can use the Princeton Geniza Project and other similar resources to study the Geniza and become familiar with this material without having to travel to distant libraries. 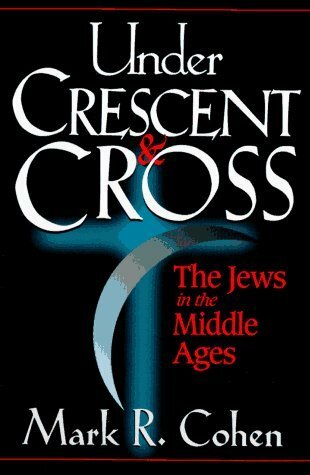 Do you consider Under Crescent and Cross: The Jews in the Middle Ages (Princeton, 2008), as your most important book? People tell me that it’s a classic. I am willing to concede that it is, in all modesty. Of the signs that it is a classic is that it has been translated into eight languages: Arabic, Turkish, Hebrew, French, German, Romanian, Czech, and Russian. A Spanish translation will come out soon. If that is the measure of a classic, then I have to agree with others who have called it that. Did you collaborate at all with Professor Bernard Lewis at Princeton? We had a close friendship, not a collaboration. We never worked on anything together, though I was given the honor of writing a new introduction to the reprint of his The Jews of Islam (Princeton Classics, 2014). It was a great pleasure to write that introduction. I felt that Bernard deserves to be credited with having written so honestly about the Jewish-Muslim relationship, depicting it in accurate and fair terms. I consider The Jews of Islam a landmark book and complementary to my own book, Under Crescent and Cross. Why should scholars continue to write about the history of Muslim-Jewish coexistence? It is very important that scholars continue to write about it because if we don’t, our silence is deafening. Scholars who know the sources need to challenge the idea of Islamophobic writers that Islam is a persecutory religion. I am convinced that the scholarship that I and people like me represent needs to reach the general public. In recent years I have written for the popular press, such as The Huffington Post, and I have been interviewed by ISLAMiCommentary and by The Jewish Daily Forward and The Jerusalem Post. I was also deeply involved in the production of A History of Jewish-Muslim Relations: From the Origins to the Present Day (edited by Abdelwahab Meddeb & Benjamin Stora, Princeton, 2013). I was a member of the editorial committee, as editor of the medieval section, and as author of the Prologue and two other chapters. I displayed and discussed this book at King Saud University, and it was well-received. It’s a book written not just by Jews and Muslims, but by Palestinians, by Israelis, by Europeans, by Americans, and others. It represents a cross-section of scholars holding diverse views. I consider this book to be a part of my legacy as a scholar. Joseph Richard Preville is Assistant Professor of English at Alfaisal University in Riyadh, Saudi Arabia. His work has appeared in The Christian Science Monitor, San Francisco Chronicle, Harvard Divinity Bulletin, Tikkun, The Jerusalem Post, Muscat Daily, Saudi Gazette, and Turkey Agenda. He is also a regular contributor to ISLAMiCommentary.